Assata Shakur: What Does New U.S.-Cuba Pact Mean for Exiled Black Panther Wanted in New Jersey? | Democracy Now! considered a leading attorney in the United States. Time Magazine calls him “one of the best trial lawyers in the country,” while the National Law Journal has named him one of the country’s top 10 litigators. president emeritus of the Center for Constitutional Rights and chairman of the European Center for Constitutional and Human Rights. CCR has been working with ECCHR to file criminal complaints against George W. Bush administration officials complicit in the use of torture. He is also the author of The Trial of Donald Rumsfeld: A Prosecution by Book. Authorities in New Jersey have said they hope a historic warming of ties between the United States and Cuba will help them capture and imprison Black Panther Assata Shakur. “We view any changes in relations with Cuba as an opportunity to bring her back to the United States to finish her sentence for the murder of a New Jersey State Trooper in 1973,” said State Police Superintendent Colonel Rick Fuentes. The encounter left both the officer and a fellow Black Panther, Zayd Malik Shakur, dead. Shakur has said she was shot by police with both arms in the air, and then again from the back. She was sentenced to life in prison but managed to escape and flee to Cuba, where she has lived since 1984. What will happen to Shakur now? We put the question to two attorneys: Michael Ratner and Martin Garbus. The encounter left both the officer and a fellow Black Panther, Zayd Malik Shakur, dead. Assata Shakur has said she was shot by police with both arms in the air, and then again from the back. She was sentenced to life in prison, managed to escape, fled to Cuba, where she has lived since 1984. I got to see her there a few years later. In 1998, Democracy Now! aired Assata Shakur reading an open letter to Pope John Paul II during his trip to Cuba. She wrote the message after New Jersey state troopers sent the pope a letter asking him to call for her extradition. ASSATA SHAKUR: I later joined the Black Panther Party, an organization that was targeted by the COINTELPRO program, a program that was set up by the Federal Bureau of Investigation to eliminate all political opposition to the U.S. government’s policies, to destroy the Black Liberation Movement in the United States, to discredit activists and to eliminate potential leaders. AMY GOODMAN: That was Assata Shakur reading an open letter to, at the time, Pope John Paul II. 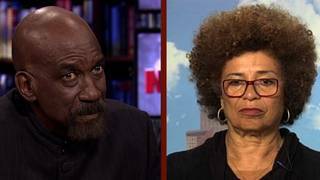 Martin Garbus, what will happen to Assata Shakur? MARTIN GARBUS: She will not be returned. Fidel Castro, when she came there, said that she would be allowed to stay in Cuba indefinitely. I had a meeting about a month ago with five congresspeople, including Representative Barbara Lee, and they were also absolutely clear that they would oppose any attempts on the United States to succeed that would get Assata Shakur back. So, to me, it’s absolutely clear she’s not coming back. AMY GOODMAN: Black Panther Sundiata Acoli has been ordered released on parole, a state New Jersey—appeals court in New Jersey, after more than four decades in prison, but New Jersey has appealed, so he’s remaining in prison. The significance of this, Michael Ratner? MICHAEL RATNER: Well, New Jersey has been outrageous about these cases. I mean, think about Assata’s case. And think about driving while black in New Jersey. Think about what’s happened from Ferguson to Garner in New York. And I ask you, “What do we think about what happened to Assata?” And I agree with Marty: There is a 100 percent chance that she will not be forced out of Cuba. A hundred percent. I don’t even question it. But, of course, you see New Jersey. They’ve raised the reward on her to $10 million. The FBI put her on their most wanted list, etc. So they’re clearly after her. But I’m completely confident, as Marty is, that the Cubans will not have her extradited to the United States. MARTIN GARBUS: If Menendez is indicted, that will be helpful. MICHAEL RATNER: What? I’m sorry. AMY GOODMAN: And we’ll link to our pieces—what did you say? AMY GOODMAN: We’ll link to our pieces on Assata Shakur at democracynow.org. That does it for our show. Michael Ratner, thanks so much for joining us, president emeritus of the Center for Constitutional Rights and chair of the European Center for Constitutional and Human Rights. As well, Martin Garbus, thanks so much for being with us, a leading attorney in this country.